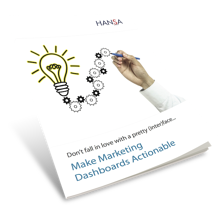 Don't fall in love with a pretty (inter)face... Make marketing dashboards actionable. Creating a dashboard is not all about having a pretty look with fancy dials and gauges. You know you’re off to a bad start if you hear people say “So what?” “That’s nice to know” or “What am I supposed to do next?” That’s your punishment if you focus on the interface. By contrast, effective dashboards become indispensable. Executives quote from the dashboard, integrate it into their presentations, and use it as input to important strategy meetings. But how do you get to this ideal and avoid the cranky pushback? Plus, get our list of the top 10 ways to make dashboards actionable! Who should read this: digital marketers, online marketing managers, product managers, business intelligence professionals, customer insights managers, marketing communication managers, and anyone who is interested in turning complicated data into business solutions.